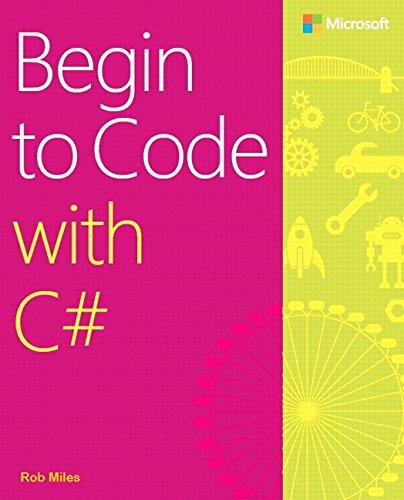 Welcome to the pages for Begin to code with C#. You can find downloads for the book at the Microsoft Press site here. A while back you had to learn how to play the guitar, and maybe even sing, to impress people. Now you can do it with your programming smarts. There's nothing quite like seeing someone using some software you wrote and finding it useful, or playing a game that you wrote (and maybe even beating you at it). Everyone should learn how to write code. It lets you give your ideas life in a way that nothing else can. Being able to pick out a couple of tunes is one thing, making the next Facebook is something else. Follow the text and "Begin to Code with C#" by making applications that are useful, and games that are fun. And pick up professional programming practice along the way.